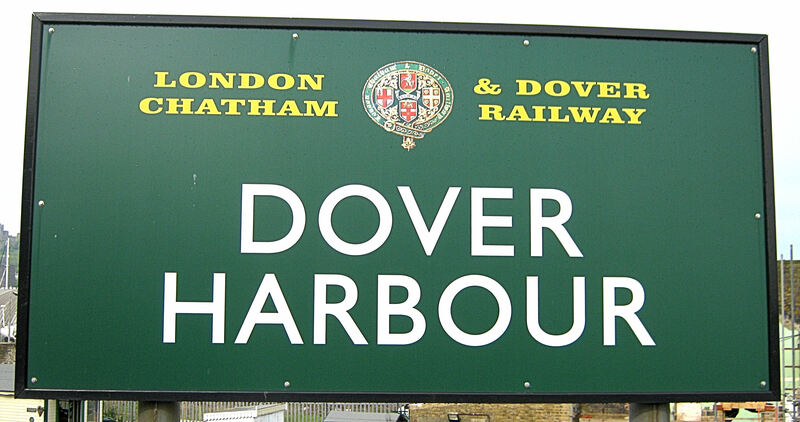 Dover’s first railway station, Town Station, opened on 6 February 1844 by the South Eastern Railway Company (SER) in the Pier District. In February and March 1845 the Mayor, William Clarke, convened well attended public meetings for a railway line from London to Dover via Canterbury. He also gave evidence before a committee of the House of commons in support of a Bill for this purpose. By 1851, the Railway Company had built its North Kent Line as far as Strood and an Act of 1853 allowed the formation of the East Kent Railway Company, (EKR), which in 1860 connected Rochester to Canterbury. Negotiations continued to join Canterbury with Dover and the new railway line was almost completed by 1860. 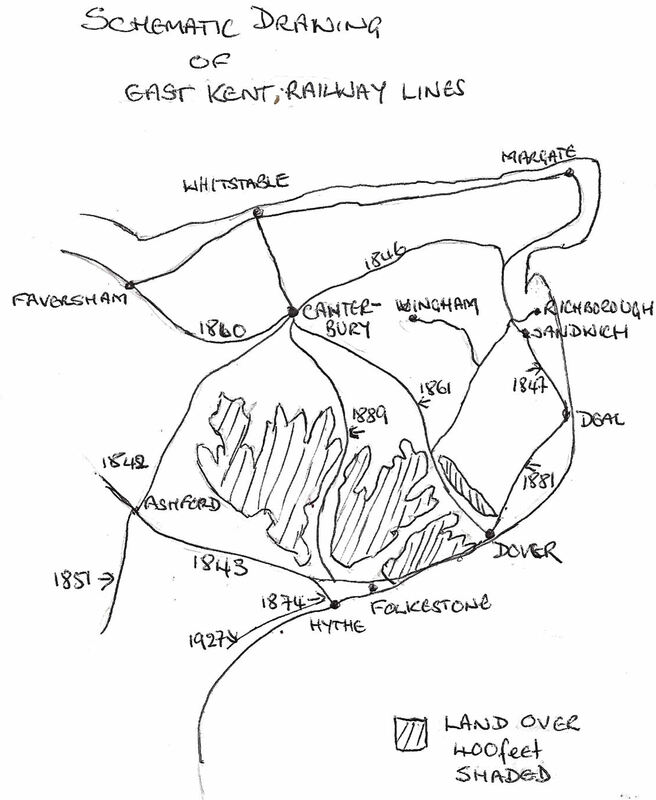 However, SER decided not to connect this line with their North Kent Line so EKR obtained an Act to build a direct line between Rochester and London, built a separate station at Canterbury and changed their name to the London, Chatham and Dover Railway (LCDR). 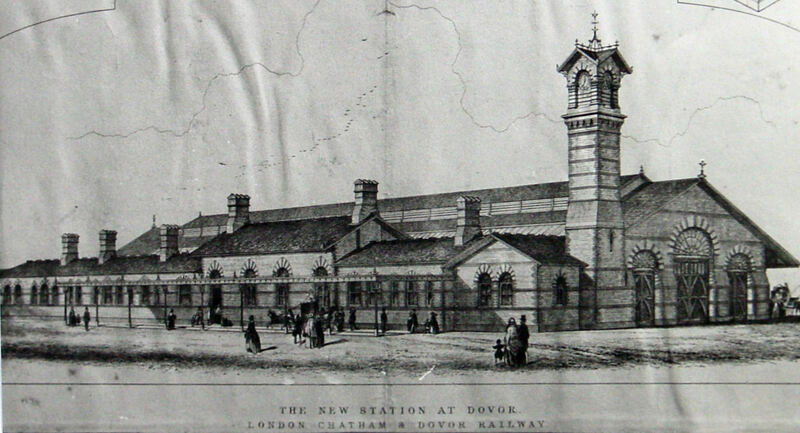 The line, from London to Dover Priory railway station, opened on 22 July 1861. 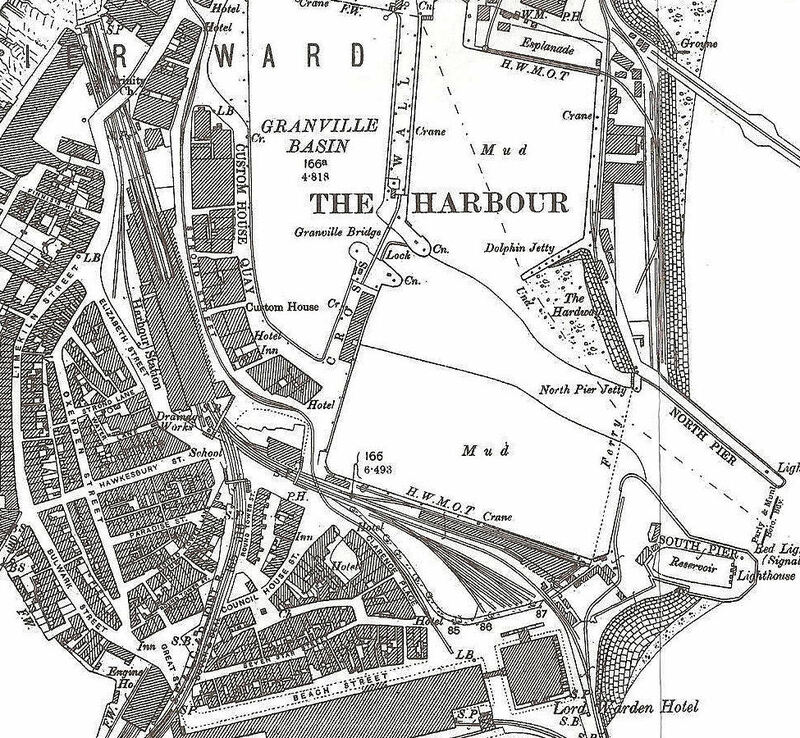 Meantime the company excavated a 684-yard (626 metre) tunnel from the Priory Station towards the docks at the western side of the present harbour, and built the Harbour Station on Elizabeth Street. However, in so doing they demolished a number of properties but tried to make out they were old and unsanitary and so were doing a favour. They were forced to pay £650 compensation to the Dover Catholic community for the priest’s house and £50 per annum to the parish for a new school in return for demolishing the Holy Trinity School. 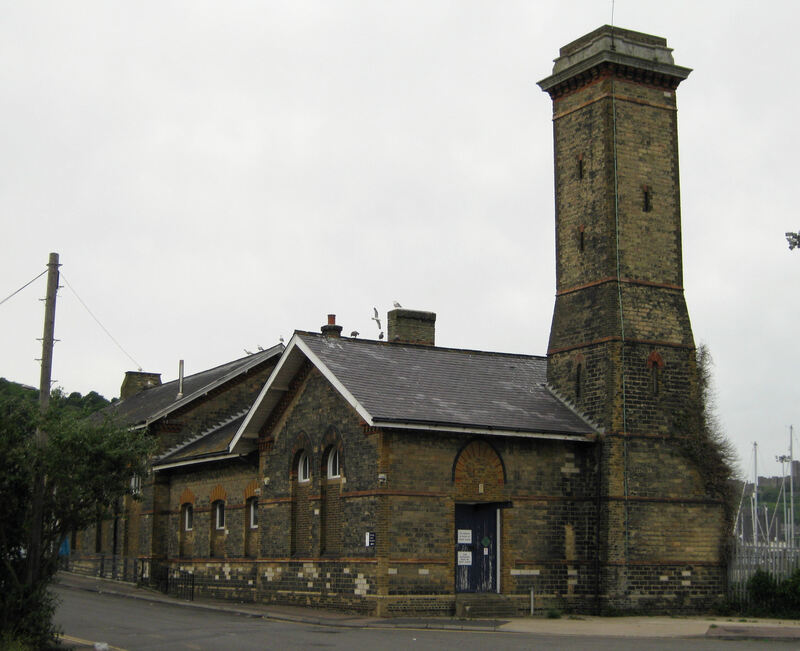 Although William Cubitt (1785–1861), their engineer, had assured the company that the line would be completed by 1 May 1861, it was decided to wait before building a permanent station. The temporary station opened on 1 November that year. Its main advantage over the existing Town Station, so it was claimed, was that luggage would go straight onto the ferries at the same time as the passengers. Their adverts implied that lost luggage was a main problem that faced passengers using the Town Station. In order to upstage SER, Harbour Station, whose Town Station had started out as a temporary structure and was, by this time, permanent, Harbour Station was planned it to be in the Italianate style. Opening on 1 November 1861 the building was dominated by a tall, Italianate style clock tower with an Italianate ornate clock. Possibly due to the lack of finance, this was still envisaged to be a temporary structure. Nonetheless, the company boasted that luggage would go straight onto the ferries at the same time as the passengers. They also made the point that passengers using the SER trains had to carry their luggage to the ships. The temporary Harbour Station was eventually replaced with the permanent structure, some of which has survived and has been given Grade II status. As the station was aimed at the cross Channel passenger, the booking office was on the harbour side of the track so that ship passengers could buy their LCDR railway tickets to other parts of the UK. It was assumed that most of their passengers going to the Continent would arrive by train and therefore already have tickets. For this reason there was little point in providing a booking office facing Elizabeth Street. The Railway Company were very proud of clock tower and the clock was used to set their time. Up until 1840, time was decided at the local level, usually by a church clock. Great Western Railway, in that year, introduced ‘Railway Time’ that synchronise railway clocks on each station and enabled the railway companies to produce an accurate timetable. Following Great Western’s lead Railway Time was adopted by all the individual railway companies and this was set by the Royal Observatory at Greenwich – Greenwich Mean Time. Unfortunately, the Harbour Station’s tall Italianate ornate clock had the obstinate tendency to be slow! This led to a businessman bringing a successful court action against LCDR after he missed his train. The clock was removed and never replaced! LDCR also provided washing facilities with running water in the lavatories. However, as most of the neighbouring households had to make do with water pumps, locals also made use of the facilities! Spiers and Pond, who pioneered railway catering in the UK, won the railway refreshment rooms’ contract. They later won the Town Station contract but lost both in 1905 to J Lyons – founded in 1887 – but Spiers and Pond regained it in 1923. In 1871, together with the SER, the line was extended on the Admiralty Pier. Ten years later a double track extension was opened to connect the SER line to the newly opened joint SER/LCDR line to Deal. Again, property in the Pier District was demolished under the pretext of slum clearance. This included a small Primitive Methodist chapel built in Round Tower Street seven years before in 1874. The Methodist community had to wait before they received their compensation, when they did they built a church in Belgrave Road. As for the railway companies, it was evident that by joining forces they had the virtual monopoly of the passage to the continent, rolling stock as well as the railway services in Kent. 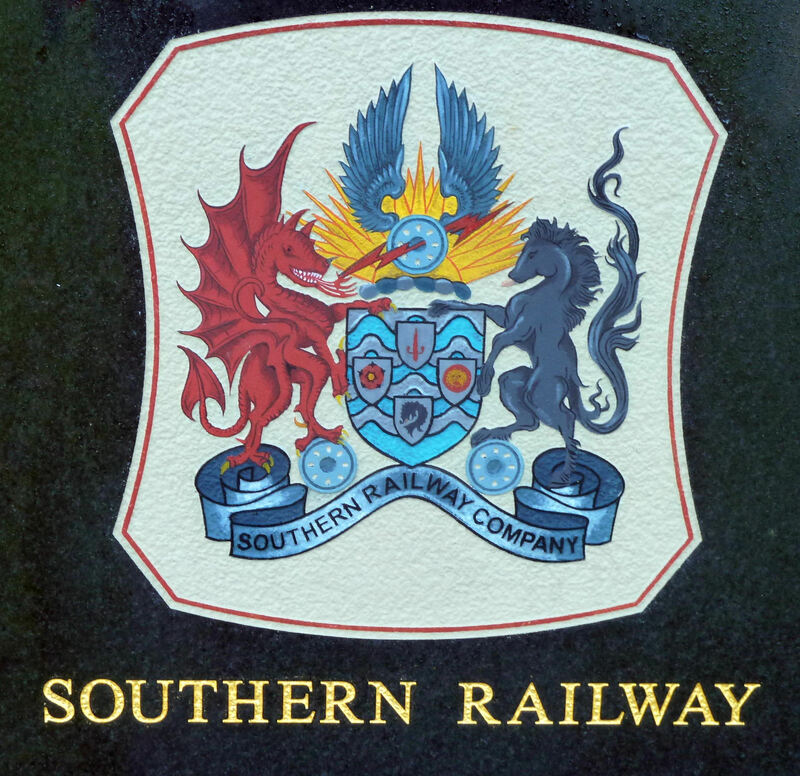 Although remaining as two separate companies, they semi-amalgamated on 1 January 1899 and began operating under a single Management Committee that was confirmed on 5 August by the South Eastern and London, Chatham and Dover Railway Companies Act, and known as South Eastern & Chatham Railway (SECR). On 1 January 1902, the Prince of Wales Pier opened and was officially completed on 31 May that year. The Mayor, Sir William Crundall, who was a member of Dover Harbour Board, and saw its potential for cruise ships. SECR, who also had representatives on the Harbour Board and they agreed to obtained an Act to build a line from Harbour Station to the Pier. In order to provide access to the new line, the down platform of Harbour Station was rebuilt – on wheels – so it could be swung out of the way as needs necessitated! 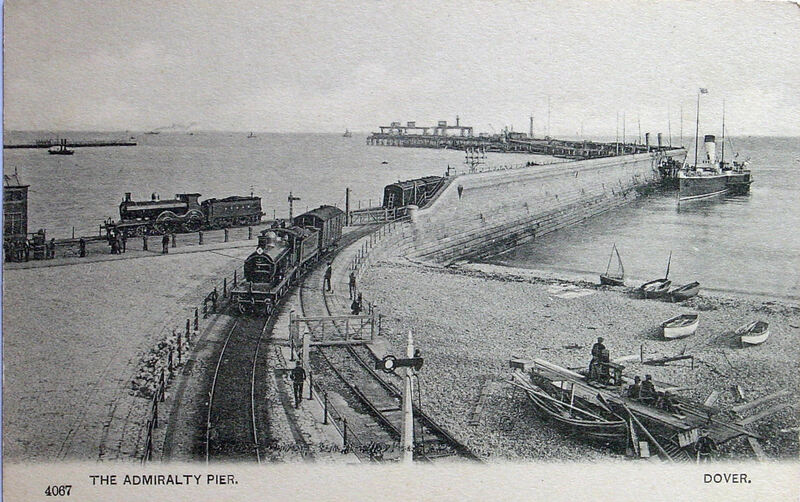 During World War I, the Seafront Railway was laid, which accessed the Harbour Station by the Prince of Wales Pier Line. At the end of 1903 one of the Hamburg-American Liners called at Dover on an experimental visit. This was followed by an agreement between the shipping company and the Harbour Board for the steamers to regularly call at Dover from July 1904. At the time Admiralty Harbour was being built, which enclosed the whole of the bay as we see today. This restricted passage and in 1906, the Deutschland collided with the Prince of Wales Pier. The damage to the liner was such that the rest of its voyage to New York had to be cancelled. After the accident, cruise liner traffic declined. As part of the creation of the Admiralty Harbour, work had started on extending the Admiralty Pier in 1897 and it was agreed that the Harbour Board could widen it at landward end. In 1907, SECR obtained a 99 years lease to build the Marine Station but before it was completed the station was commandeered for the duration of World War I for military use. Marine Station was returned to civilian use in January 1919 and became the main station for cross Channel passengers. On 19 August 1921, the Railways Act received Royal Assent that proscribed all the railway companies, which were in private hands, to merge into four ‘Groups’. One of these was the Southern Railway Company and was made up of railway companies that operated south of the Thames and included SECR. Southern Railway came into operation on 1 January 1923 and the following year it was announced that the Harbour Station was closing and finally did in 1927. At the time it was agreed to demolish the building to make room for new custom sheds and warehouse accommodation. Harbour Station with reduced size clock tower. Partial demolition was completed by June 1929 when the ferry captains put forward the case for keeping the clock tower as it provided an excellent leading line. The tower was reduced in size, a light fixed on the top and it was decided to keep the connecting building. This remained in the hands of Southern Railway Shipping department, which together with the railways was nationalised on 1 January 1948. The 1980s saw British Rail broken up and sold including, on 27 July 1984, Sealink UK Ltd the owners of Harbour Station. After a couple of changes of owners and name, the company joined with P&O on 10 March 1998, to form P&O Stena Line. In August 2002, P&O bought out Stena Line and gained full possession of the old Harbour Station. By that time the building was Listed and the shipping company used it for training. In 2010 P&O put the old Harbour Station on the market and following negotiations that lasted nearly two years, John Shirley, head of a Snargate Street freight-forwarding business took over the building early in 2013. He plans to institute the ‘Green policy’ similar to that he successfully put in place at the offices in Snargate Street. This included recycling and composting measures, installation of a sedum grass roof, solar panels, rainwater harvesting and use of wood-pellet boiler. 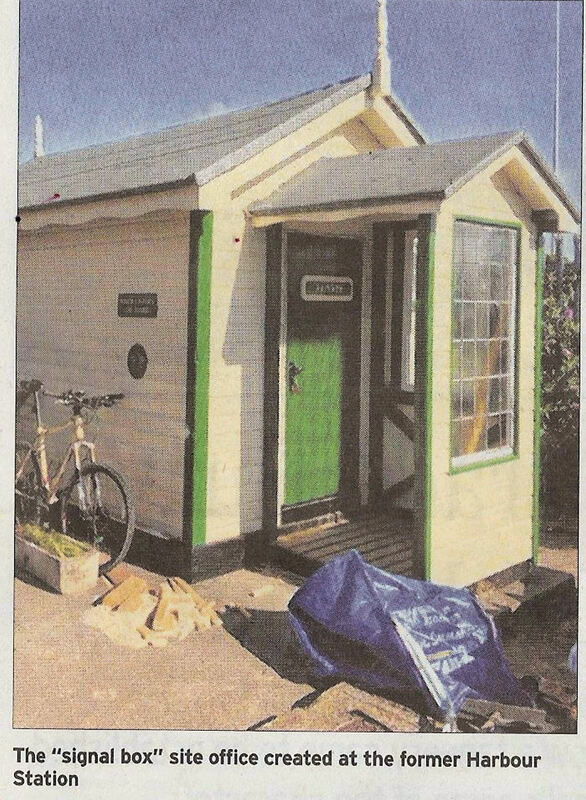 In preparation for converting the old Harbour Station, Mr Shirley constructed a site office using recycled bits and resembles a signal box. Since then he has refurbished much of the old station adding appropriate historic memorabilia. More recently the Booking Hall has been converted into an independent entertainment venue with a standing capacity of 350. It boasts of in-house professional sound and lighting and designed with touring artists and the community in mind. The aim is to bring some of the biggest names in the industry to the venue, as well as encourage and promoting local talent. These days, besides live music, comedy, theatre and community events are stages at what is called The Booking Hall. This entry was posted in Harbour Station, Port and Transport. Bookmark the permalink.